We have found lots of great resources for you to try out. We hope you find something you like. Tai Chi Breathing: Your Health Booster! Discover the Real "Closed Door" unique techniques. You will be amazed. There appear to be quite a few books about shibashi - shame we did not have them when we learnt the form. Mostly they do not have shibashi in the title - that's why it took us so long to find them. K.Y.Wong ISBN 9781864760989 - in review pile! Explains some of the basics of Shibashi a very small book with cryptic instructions and pictures that don't always quite match up. An interesting place to start. by Michael Tse ISBN 07499-1336-3. Each step is explained in detail and there is an overview of Qi, Qigong and meridian channels. We've had a quick look and we like it. It's in the review pile. by Chris Jarmey ISBN 1-903333-05-9. Covers the theory of Qi and the principles of practice and breathing. Uses line drawings to show the moves and gives some good tips about achieving the best effects. We've had a quick look and we like it. It's in the review pile. 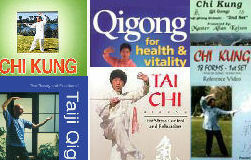 reveals the healing and health maintenance art of Tai Chi. Developed from ancient Chinese philosophies, Tai Chi uses the principle of relaxation as a tool for good health. This book gives step-by-step instructions and detailed illustrations to help you follow the Tai Chi Qigong movements easily. It provides a thorough background to the development and principles of Tai Chi and makes it simple to understand. Consumer Notice : This site is supported by affiliate ads. This means that if you buy something from a link, an ad or a recommendation on this website we might get paid an affiliate commission. Thats how we pay the bills and keep the site up and running.